ESC is a game about the future, but not a future of flying cars and high tech corporate espionage -- a future that is at odds with its past. 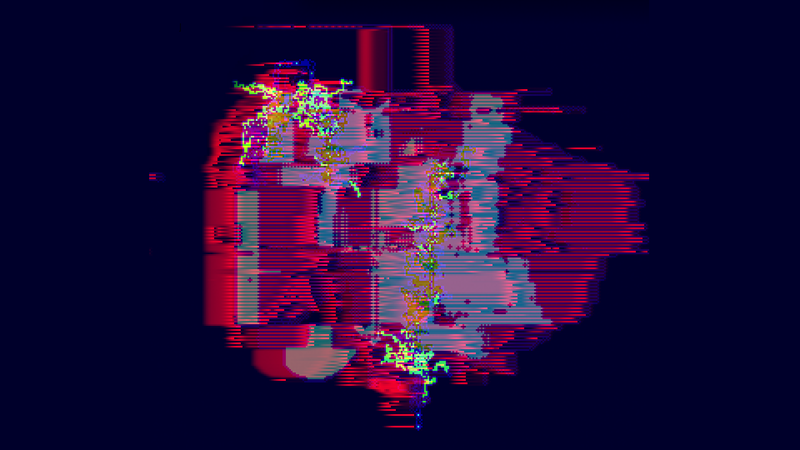 It’s a game that asks the player to look into a cyberpunk world, then ask how they got there. It’s a curious setting and one that would not have been nearly as interesting if not for ESC’s talented dev team. ESC’s lead developer/ writer/ composer/ multi-talented human Lena Raine agreed to answer some of my questions about ESC and how it became so good. First things first: Introductions. Who are you? Hi! I am an awkward individual that somehow managed to get the chance to write music and fiction for a living. I'd been doing the AAA game industry thing for about 10 years before making the move to self-employment. I got an unexpected break & ended up composing tracks for Guild Wars 2, which led into the other opportunities and solo endeavors from there. I also turned a hobby of writing fiction into a professional thing with my first novel City of Tigers back in 2014, and short stories that I've self-published on itch. ESC is what I would consider my second full-length work. So you’ve already made a name for yourself as a musician on games like Celeste. Why did you decide to move into writing and developing your own project? I've been doing my own projects for years, but perhaps not on the same scale as ESC. Because I worked as a quest & level designer for about 7 years, I'd picked up enough scripting experience to feel confident picking up Game Maker Studio's GML and create my own thing. I'd written the first draft of ESC back in 2012 for National Novel Writing Month while I was finishing up City of Tigers. I pictured the whole thing in my head as this rad interactive experience but had absolutely no confidence in my ability to pull it off. So I sat on the manuscript for years. At the start of 2017 I attended both GDC & PAX East and was so inspired by the work being done by my friends in the visual novel space & thought, I can do this. I need to do this. So I began work on prototyping all the systems that would eventually turn into ESC. ESC wasn’t just made by you, you assembled an awesome team full of really awesome and up-and-coming folks. How did you get this crew together, and how did you pick the final team? I knew going in to the project that I'd need help in two specific areas: visuals, and sound design. I'm certainly not a visual artist, and while I've done sound design, I don't consider myself expert enough to pull off the kinds of sounds I wanted for the game. Maddi, as Dataerase, has become a bit of a staple in my social circles. She does amazing glitch art, sometimes based on old Japanese PC games, but has developed an abstract style all her own in a unique venue: clothing design. Almost all my friends have at least one garment she's designed. Over the years it's become a very recognisable metaphor for how I see my own internal brainscape. Because most of the game takes place in a cerebral context, I thought her art would be a perfect way of accompanying a text-driven story without overpowering it. For the sounds of ESC, the challenge was in creating specific audio profiles for a retro reinterpretation of a text-based roleplaying MUCK, an unknown future interface for reading blog entries, and a hybrid of the two, complete with foley-style sounds as things start feeling uneasily real. I knew 2 Mello from his work for indie games, but he also contributed an amazing remix to Celeste. He's a relatively unsung & rising powerhouse in the music world, but also has a wonderful ability to fabricate & alter sounds to feel both real but manufactured. Last but absolutely not least, I got in touch with Nick Suttner from his amazing work on Celeste. While I had a very specific voice in mind with my writing, I trusted in his ability to punch things up and make sure my writing was as clear and impactful as possible. Where did you find inspiration to make a game that feels like 50% high technology and 50% archaeology? My entire childhood was basically formed around the context of roleplay. Even before computers I was running around acting out stories with my friends. I grew up in my teenage years as various characters on the same kinds of text servers ESC takes place in. It was only natural that in telling a coming of age story, it would be in the context of my own adolescence. On the other end of the spectrum, I'm fascinated by technology, AI, and the development of intelligences beyond our own understanding. Because the technology of ESC is so in line with the trajectory of our own innovations, I've had to continually update my fiction to avoid sounding like I was ripping off something I technically wrote first. (As an example, Frames were originally called HoloBands. And then the HoloLens came along). I’ve found interactive fiction is a hard sell for a lot of people. What would you tell people who might be hesitant to give ESC a chance? When a lot of people think interactive fiction, the first thing that probably comes to mind is twine games. Short, usually autobiographical stories with clickable keywords. I have a huge amount of respect for these authors, but with ESC I wanted to make an engulfing experience. I wanted to get out of the browser window and let the reader feel like they're reading something in the world it takes place in. 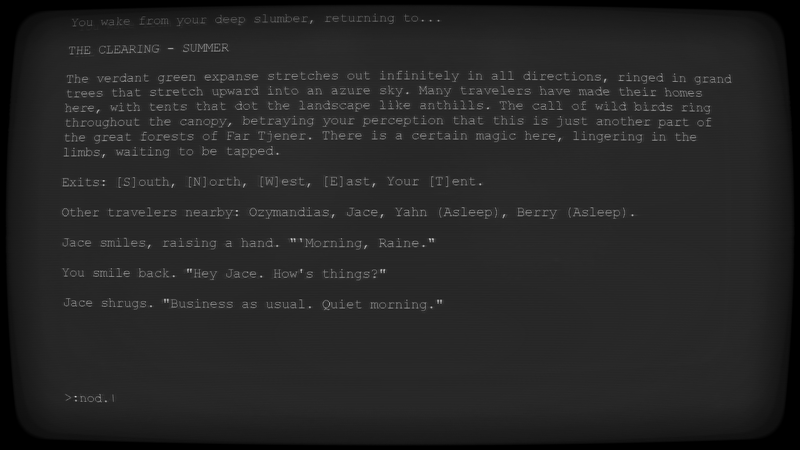 My primary inspirations weren't twine games, which I love, but larger titles that have been inspired by the text adventures that pioneered the genre. Things like Lost Odyssey and NieR Automata, who both venture into interactive fiction as a means of telling a portion of their stories. I wanted to take those kinds of experiences even further, into a standalone thing.